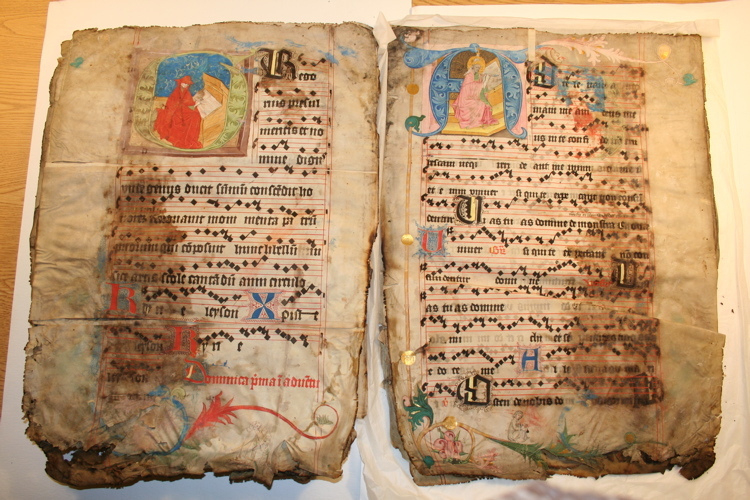 In 1993, the St. Marks Library of General Theological Seminary suffered a devastating fire that severely damaged one of their most treasured items, a Utraquist Gradual dating from 1450-1460. In 1993 a NYC based conservator performed disaster recovery and flattened the water and fire damaged leaves. A different conservator performed a condition survey in 2006. The Library was undergoing another renovation and contacted me to devise a housing system for the safe moving of the fragile manuscript, short and possibly long term storage. 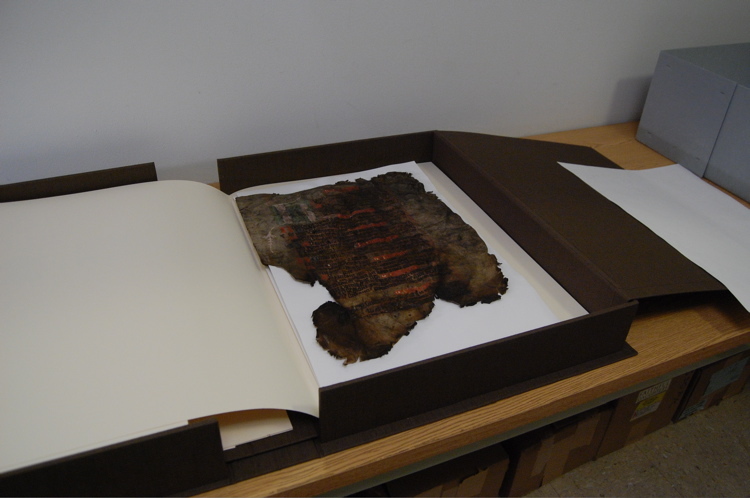 The scale of the damage makes it unlikely that the manuscript will ever be conserved or returned to a codex form. 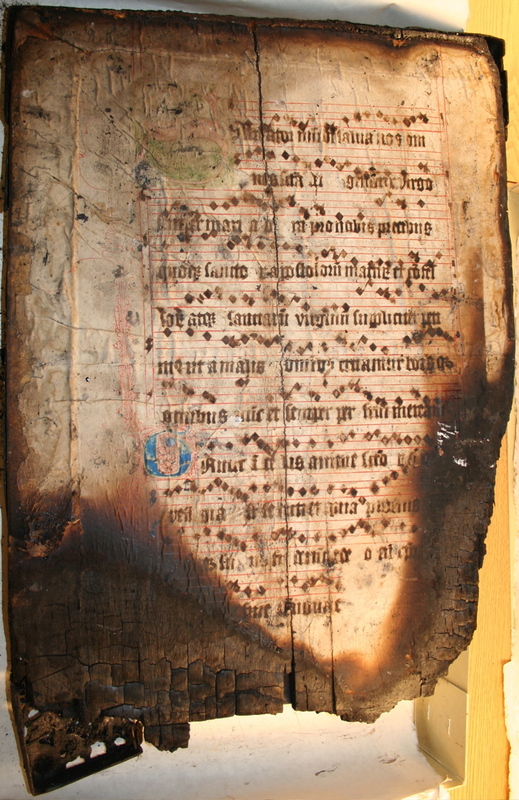 The only documentation of the manuscript before the fire was a black and white microfilm. The above pre and post fire photographs illustrate the extent of the fire and water damage, and the fragile condition that had to be taken into account when I devised a safe storage system. These photos are of the same opening. I. PHYSICAL PROTECTION FOR THE SHORT AND POSSIBLY LONG TERM. The leaves were all very damaged from water and fire, suffered many tears and losses and were extremely fragile. The leaves are very large, (around 58 x 41cm) and needed support and gentle restraint to prevent abrasion when moved. The housing needed to allow access to both sides of the wood boards without handling them directly, and support the wood. II. FLEXIBILITY FOR POSSIBLE DIMENSIONAL CHANGES AND ENVIRONMENTAL FLUCTUATIONS. 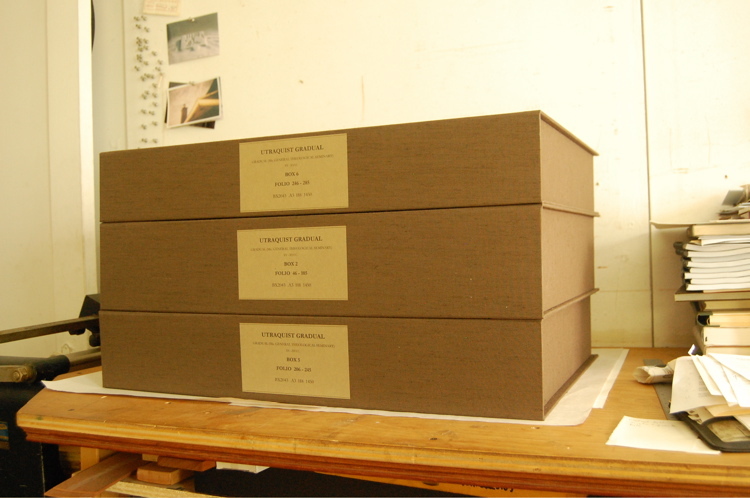 The boxes needed to be adaptable for changes in the dimensions of the pages if flattened, consolidated or repaired. This way the majority of the cost of the boxes would be for permanent storage. The boxes also needed to be adaptable to compensate for environmental fluctuations. III. SECURITY. There needed to be an easy system for visually identifying if all the leaves are present if the leaves are accessed, (which I did not recommend—the leaves were far too fragile to be handled). Loose leaves are notoriously difficult to keep track of. IV. APPEARANCE. The boxes needed to reflect the level of care and importance that St. Marks Library and General Theological Seminary provides for one of its treasured items. This system required that all components will be stored and moved flat. Because of the extreme distortion, the manuscript was divided into 6 sections of roughly 5 quires each. Any more leaves created a very unstable stack that was prone to tipping over. The conservator who surveyed the manuscript suggested this and I agreed. Even with the division, there were differences of over 40mm in some areas of the stacks due to the distortion of the leaves. Unfortunately, this greatly increased the space the book takes up, and each box is quite heavy. 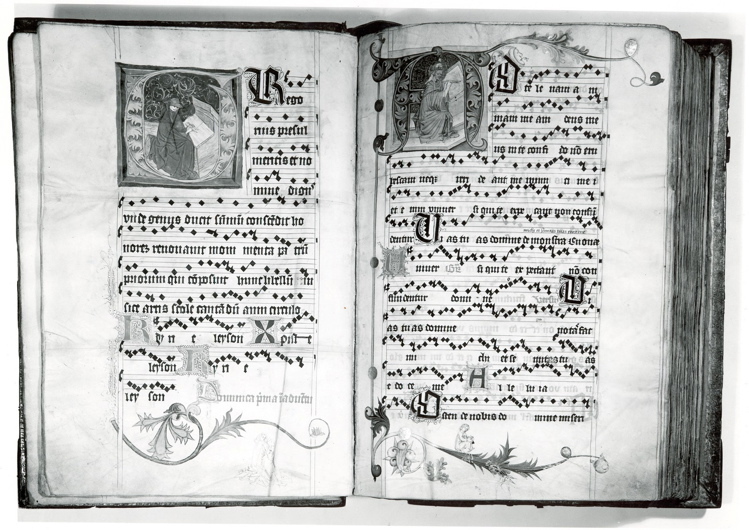 First, each quire was wrapped with a folio of microchamber, cut 25mm larger than the leaves on three sides. The leaves were difficult to align exactly and some extra room at the margins prevented abrasion if they are removed from the housing. The extra margin also keeps open the possibility of using the housing if the leaves are further flattened. The leaves were very fragile and needed support. The leaves had been previously interleaved with thin microchamber paper, and this was left in place. 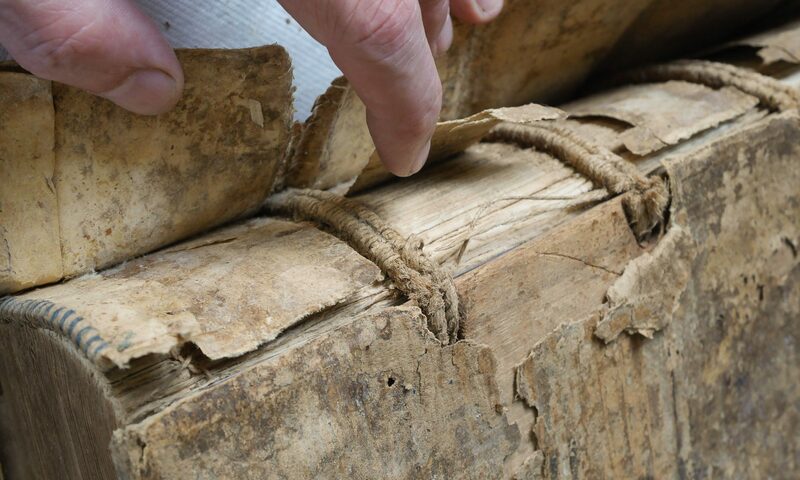 The damage to the spine folds is so severe on some folios, a thicker interleaving paper could have caused damage. A few of the quires are still conjoined. The outside of quire paper is labeled with laser printed labels on buffered paper. Second, each group of quires, normally five, were placed into a cloth covered board three flap inner wrapper. This three fold wrapper was constructed of Tschudi Binders Board, Jade 403 PVA and Canapetta #1470 Book cloth and lined with an appropriate buffered paper. Its thickness was carefully calculated to provide gentle restraint to the movement of the parchment, protection from abrasion and clearance around the edges to prevent damage. The inner wrapper was constructed separately from the clam shell box, prevents the parchment from expanding too much, and makes it possible to lift the fragile leaves without abrading them. Each wood book board was placed in a separate inner wrapper, which made it possible to examine both sides of the board if necessary without directly handling the board. The charred areas were essentially charcoal and very fragile. 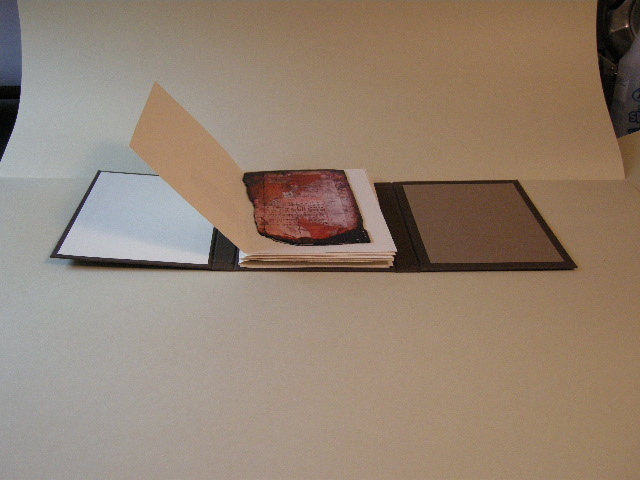 A wedge shaped insert raised all four corners of the manuscript so there is even pressure on top. The wedge has a double slant to compensate for distortion. The bottom folio contains spacing material to maintain a gentle, even pressure on the manuscript. The spine of the folios were marked, much like modern printers signature marks, so that a quick visual check could confirm that none were out of order or missing. Below is a model I made of the inner wrapper to illustrate the concept to the St. Marks Library staff. The three flap wrapped can be closed on the left side, then opened flipped upside down to consult the other side of the board without having to touch it. Irregular areas of the board were supported with custom carved ethafoam. Below is a image of the actual boards to give an idea of how burned and fragile they are. Third, each inner wrapper was placed in a separate clamshell box, with a double inner tray wall. This clamshell box was constructed of 3mm Tschudi Binders Board, Jade 403 PVA , Canapetta #1470 Book cloth, and lined with an appropriate buffered paper. Each of the three components of the housing system were labeled with laser printed labels on buffered paper. 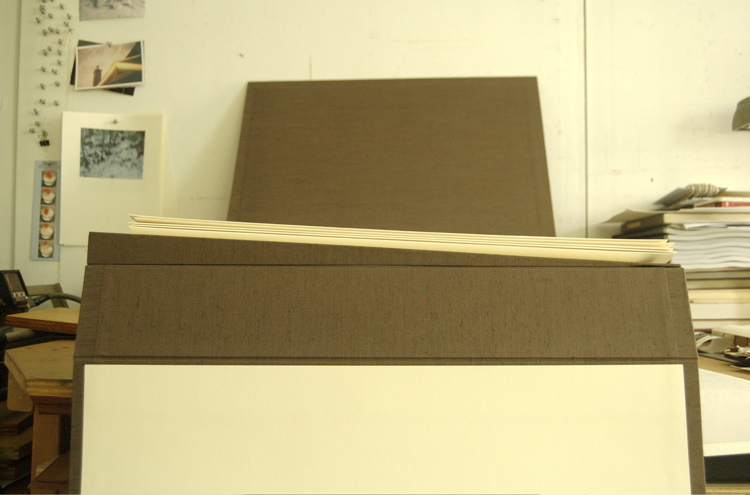 An extra folio of paper stores several layers of acid free corrugated board in the bottom of each inner wrapper so that if necessary, the restraint on the leaves can be slightly tightened or loosened by inserting or removing layers of board. This is important while the manuscript if moved, stored off site during construction, and returned to a new building with as yet untested climate conditions. This a leaf in the quire wrapper during final installation. And here are three of the six finished boxes. It is always sad to deal with such damaged material. Stabilizing, securing, providing physical protection against possible future damage and limiting access are about all that can be done, yet when I was finished with the project there was little sense of satisfaction. I felt a little like an coffin maker rather than a conservator. Perhaps this tragedy can serve as a cautionary tale for other institutions and collectors– we all must be constantly vigilant about possible risks. No one will ever be able to experience this manuscript like it was before the fire. Losses like this, which are difficult to quantify, degrade our unique, tenuous, physical relationship to past cultures and times. Thanks to the St. Marks Library for giving me permission to share this information.